In our living room we have a gas fireplace that is frankly dreadfully bad at all the things you might want a fireplace for, so after several years of having not used it at all, we decided it was time to finally just pull the thing out and replace it with an electric unit that would be more efficient and aesthetically pleasing. This would necessitate tearing up the wall to get it out, and redoing the carpet (because it would otherwise have bare spots where the fireplace used to be. So as long as we were going to have to do that anyway, we decided that now is the time to redo the whole damn room. 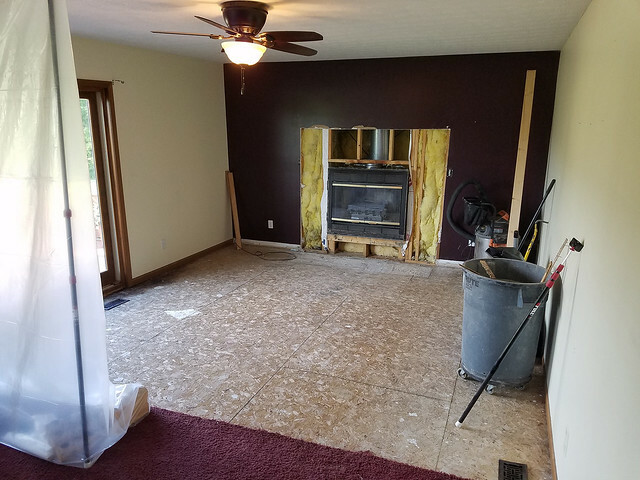 So: Here it is, the first day of the renovation, with (most of) the former carpet torn out and a big ol’ hole in the wall where they’re going to haul out the fireplace. After which we’ll patch up the wall and put up shelving and a wall mount for the TV and we’ll have a nice, cozy kinda-home theater setup. It’ll be great! When it’s done. Right now, well. It looks like my house is torn up. And it’s confusing the hell out of the cats. I guess we all make sacrifices. I will say I’m happy I woke up ridiculously early and hit my word quota for the day before the contractors arrived, because they are not the silent type. In any event: This is what the next few days will be like around the Scalzi Compound. Whee! Can you get spooked by your own writing? J. Lincoln Fenn was, by what she wrote for her latest novel Dead Souls. 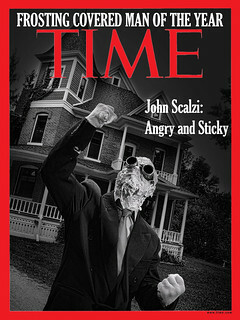 What was the cause of the self-inflicted spooking? Read on… if you dare. It’s a strange thing to write a story intended to creep people out, but it’s a stranger thing when your novel creeps you out, and the fine line between art imitating life seems to disappear altogether. Dead Souls is a “Deal with the Devil” story, a trope that began in the 6th century with an unhappy cleric called Theophilus who sold his soul when someone got a promotion he sorely desired (jealous much?). It was a story that, zombie-like, would not die, and went on to inspire Christopher Marlowe’s The Tragical History of Doctor Faustus, Johann Wolfgang von Goethe’s Faust, Benét’s famous short story The Devil and Daniel Webster, heck, even the movie Tenacious D in The Pick of Destiny. What intrigued me about such a well-worn tale was the way in which it paralleled a Buddhist idea called ‘klesha’, which is the way in which a negative thought can lead to negative actions, actions that then unravel your life in unexpected, and irrecoverable ways. The devil can’t just take a soul ad hoc—the protagonist has to create the opening through which the devil can enter. In Theophilus’ case, it’s pure jealousy. 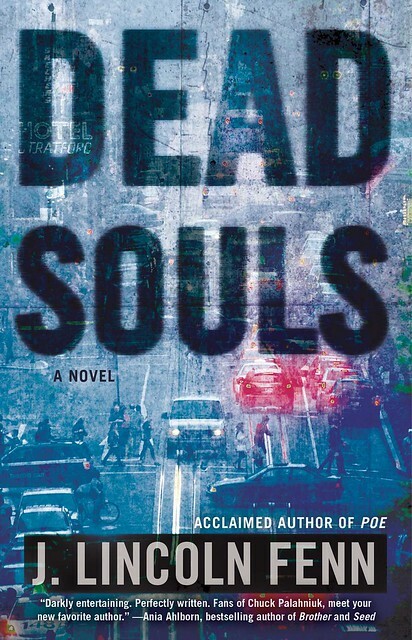 In Dead Souls, Fiona Dunn suffers from anxiety and jealousy, a toxic klesha that makes her suspect her boyfriend is cheating on her, that leads her to a bar to drink her woes away, and settles her on a stool next to a man who claims to be the devil incarnate, Scratch. As an atheist and a career marketer who knows the many ways of manipulating human psyches, of course she doesn’t take him seriously. At least he’s a sympathetic listener. 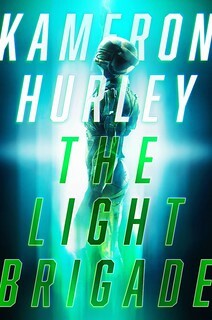 So when he offers her a trade—her soul in exchange for the power to be invisible so she can see what her boyfriend is really up to—I mean what the heck, why not? That Scratch also requires a favor (to be determined later) hardly seems to matter. She suffers the hangover of a lifetime when she wakes up the next day and finds that it is, unbelievably, all true, but at least she’s not alone—there’s a support group of fellow ‘dead souls’ who have also sold their souls on a whim, and they meet weekly in a bar converted from an old church. It’s an opportunity to commiserate, and speculate about which violent news items might actually be favors that the devil has called in. Drone strike that killed a family? Murder/suicide of a father and his three children? All possibilities, unnerving reminders that one day they’ll also have to give the devil his due. Then I got a note from my agent saying that, having finished the book weeks ago, she still found herself unable to do [CAN’T TELL YOU, SPOILER] without feeling creeped out. It’s not that I think I literally conjured the devil—hypothetically if he did exist, there wouldn’t be much need for him to muck about with humanity since we’re quite capable of violence on our own. But it did make me examine my own kleshas, the doors in which hell, especially the kind we create, could enter. I found a smattering of anxiety, and jealousy, and much more than a smattering of fear. Where did it come from? How much of it was created by a marketer like Fiona, and fostered by the advertising, and the algorithms, and the constant stream of ‘curated’ stories so we will buy, and vote, and see what someone else wants us to? And how often do we exchange a bit of our soul in the form of data, a trade that doesn’t seem like a trade at all because where that data goes, and what it’s used for, is never revealed? A deal that could come back to haunt us one day in unexpected, and potentially unpleasant, ways. Maybe Shakespeare got it right when he wrote, “Hell is empty, and all the devils are here.” Maybe we should all be a little more creeped out than we are.